Radio Frequency IDentification (RFID) products available from Comtel Technologies cover a wide range of personnel and asset tracking. 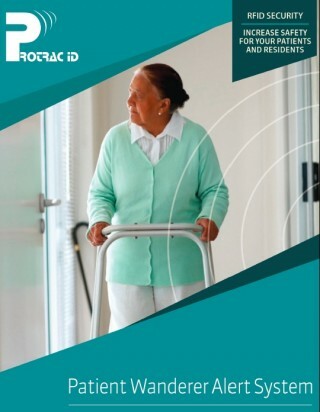 RFID is commonly used for 'Wandering Patient' systems, whereby an Aged Care Facility Resident (particularly dementia residents) wears an indiscreet RFID transmitting tag or wristband which will interact with a receiver unit attached to the Access Control System, automatically locking doors when the resident approaches to prevent abscondment. This situation could be applied to a variety of applications outside of Aged Care, such as Infant Infirmary to prevent 'baby snatching', pre-schools and kindergartens, Community Health Centres and Mental Health Institutions. RFID solutions include Ultra Long Range RFID tracking tags with an in built membrane switch and indicator for manual call functions such as emergency call, nurse duress/man down and machinery stop. Our ‘Active Tags’ are powered by an internal lithium battery. The tag will for the duration of its life transmit a Radio Frequency (RF) signal at a pre-set time interval. The tag life is estimated up to 5 years at a transmission time interval of approximately 1.5 seconds. The transmitted tag data includes Customer Site Code (CSC), Tag ID, Tag Age Counter Value with the options of Movement Alarm and Tamper Alarm Status. ID Asset Tags are encapsulated in a moulded plastic case, which is ultrasonically sealed during the manufacturing process for adverse environmental conditions. The affixing of a tag depends on the type of application: double-sided adhesive tape; ID card straps or lanyards; pocket or lapel clips. Tags have a standard ID card footprint for attaching a photo ID. Models are available with in-built MIFARE, HID prox or HID i-class electronics making personal photo ID, access control, tracking and emergency call transmitter all in the one “credit card” sized tag. Tag Features include: • Active 24 x 7 • High Impact resistant UV stabilised PVC constructions. • Transmission unaffected by materials in the surrounding environment. • Easily fixed to all surfaces including metal. • Convenient size (60mm x 29mm x 13mm) for application to large and small assets. • Tags attached to road transport, rolling stock and cargo are monitored at up to 220 kph. • Tags are read by fixed, mobile or hand held receivers.